It is important to have an idea of the number of calories you need per day to maintain your current weight. Conversely, if you are attempting to lose or gain weight, you can take the number of calories you need each day to maintain weight and subtract 500 to lose 1 lb. per week or add 500 to gain 1 lb. per week. However, your caloric intake should not go below 1,200 a day for women and 1,800 a day for men, according to the American College of Sports Medicine. In general, a moderately active 19- to 30-year-old woman needs 2,000 to 2,200 calories a day, whereas a man in the same category needs 2,600 to 2,800. A 31- to 50-year-old woman at the same activity level needs 2,000 calories and a man needs 2,400 to 2,600 calories a day. A woman older than 50 needs 1,800 and a man older than 50 needs 2,200 to 2,400 calories. 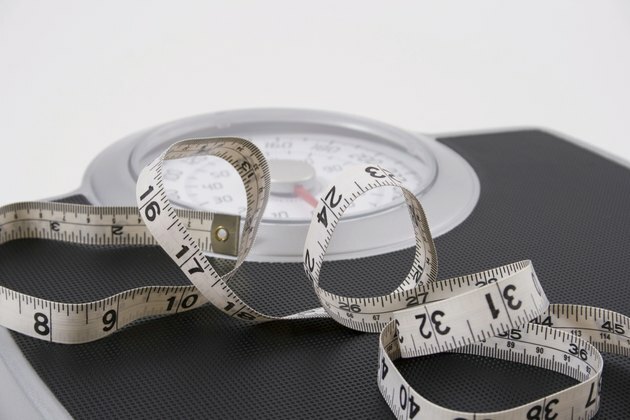 One factor that affects the number of calories you can consume is your body composition. Muscle requires more calories than fat, so the more muscle you have, the more calories you can consume without gaining weight. In general, men have more muscle mass than women, so they can eat more calories than women. However, body composition can vary within gender and age. Height and weight affect your caloric intake, so it is best to figure out individualized caloric intakes. Your basal metabolic rate, or BMR, is the number of calories your body uses each day when resting. There are two different equations depending on whether you are a man or a woman. If you are a man, use the following equation: 66 + (6.23 x weight in pounds) + (12.7 x height in inches) - (6.8 x age in years). If you are a woman, use this equation instead: 655 + (4.35 x weight in pounds) + (4.7 x height in inches) - (4.7 x age in years). Whether you are a man or a woman, the amount of physical activity you engage in affects the number of calories you can consume. Multiply your BMR by the activity level you fall under to learn your total calorie needs per day. Multiply the BMR by 1.2 if you rarely exercise, by 1.375 if you engage in light exercise, by 1.55 if you are moderately active, by 1.725 if you engage in hard exercise or by 1.9 if you perform intense exercise or exercise twice a day. American Council on Exercise: What Is the Best Method for Determining an Individual’s Ideal Body Weight? How Many Calories Should You Eat to Weigh 140 Pounds?